New stuff at Made By Girl - check it out! One of my favorite 8x10 prints in my shop by far, the new GOLD Love print. 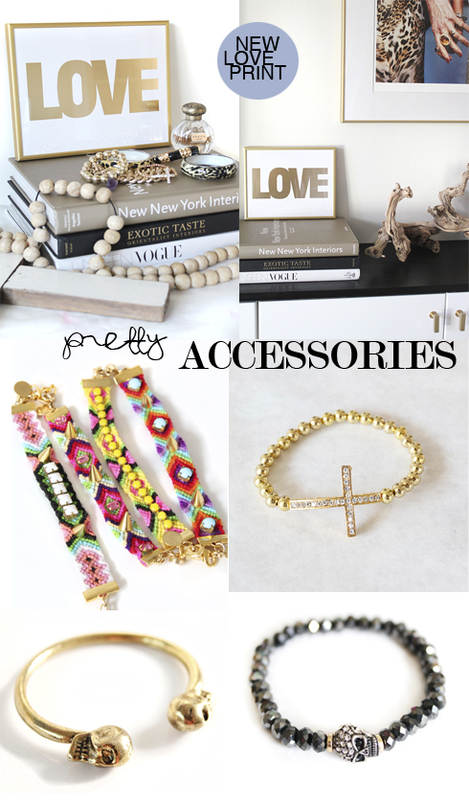 We also have some new accessories, gold crosses, colorful handmade friendship bracelets & more! Take a look on Made By Girl. So many pretty things! Love the Gold LOVE print!! The new LOVE print with that gold frame is amazing! AAhhh---yes. Pretty indeed. Great additions! Love the new LOVE print !! Now the dilemma is do I go for the old gold LOVE print or the new one? They are both TOO good. tiffany leigh: i personally like the new one - but it depends where you want to put it. I just purchased the original, and now there's this one - I've got a feeling there's going to be a lot of 'Love' in my house!! Hi Jen, I couldn't resist and bought your cross bracelet, can't wait to get it. LOVE the new LOVE print!! I think it would look great with my yellow Love print! I was wondering if it would be possible to ship the item in the philippines?